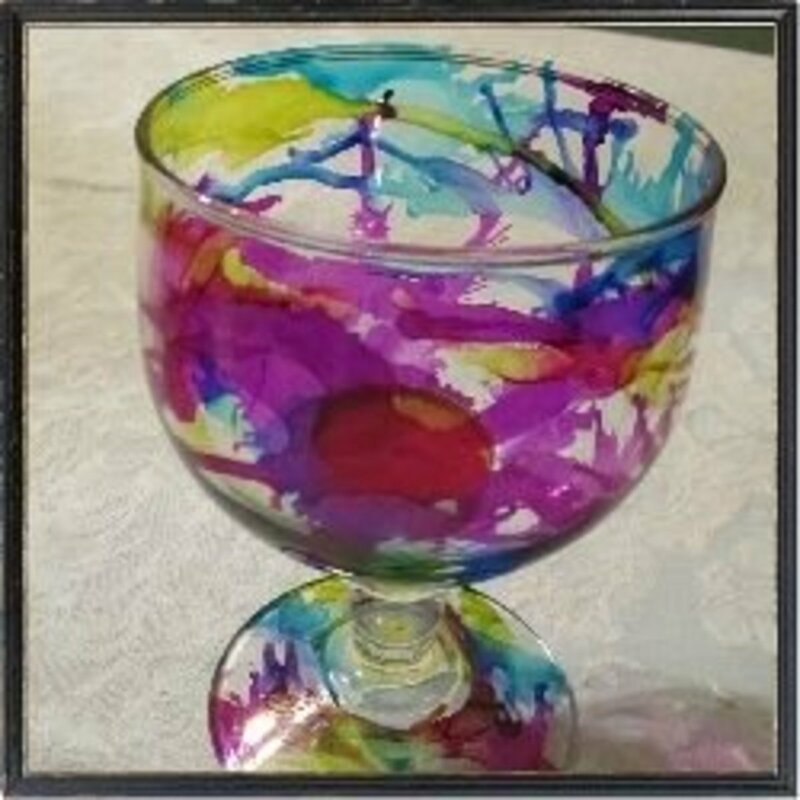 Decorating glass with alcohol inks is easy and yields beautiful results. I've worked with them to decorate cards and wanted to try using them on glass. I saw this fun project on Pinterest, had the materials on hand, and made sure to try it. The process was pretty simple, and the results were stunning! My mom, aunt, sister-in-law, and I get together for a girly day every other month. This was my project for April, and it was a big hit! 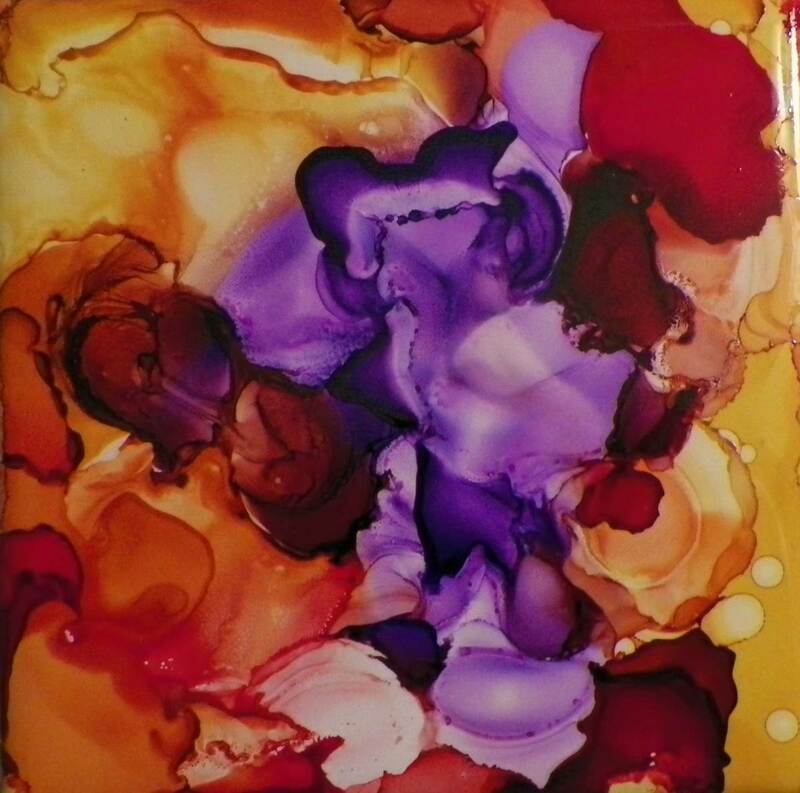 Alcohol inks are solid-based dyes that can be used on any nonporous surface. They works well on glassware, ceramics, metal, tin, plastic, and glossy paper. Wood or regular card stock paper won't work well because their surfaces are porous. 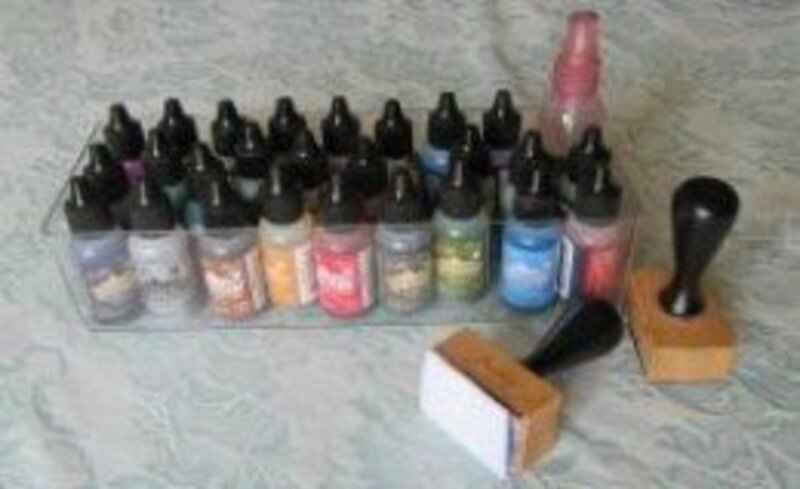 The product comes in a bottle with a dropper type dispenser, which makes it easy to use. Do note that it dries very quickly, so you'll need to work quickly to create your design. Before starting your project, clean the glass surface and remove any labels using a mild dishwashing detergent. Let it dry completely before beginning the DIY to get the cleanest look. Alcohol ink stains! The good news is that it wears off pretty quickly. You can wear rubber gloves to prevent this, but I find it difficult to grip the glass when doing so. Don't worry about mistakes. You can clean them up with regular rubbing alcohol from the drugstore. Do not use this on glassware that will touch food or beverages. It should only be used for decorative purposes. The combination of alcohol ink and compressed air creates a lot of fumes! Make sure you are in a well ventilated area when indoors or outside (when the weather is nice. Smooth glass containers work best for the spatter technique. If you want to use cut or embossed glass, it'd be best to look into other methods. That's all you need! Now let's begin decorating. Squeeze out a few drops of the ink onto the glass. Three drops usually cover a good area. Quickly spray the ink with compressed air to create a spatter pattern. It is very important to use the straw so you can aim the air exactly where you want it. You can experiment with the angles to get different results, and the colors will blend and create new colors as they run together. The ink dries very quickly, so it's not a bad idea to work with a friend! 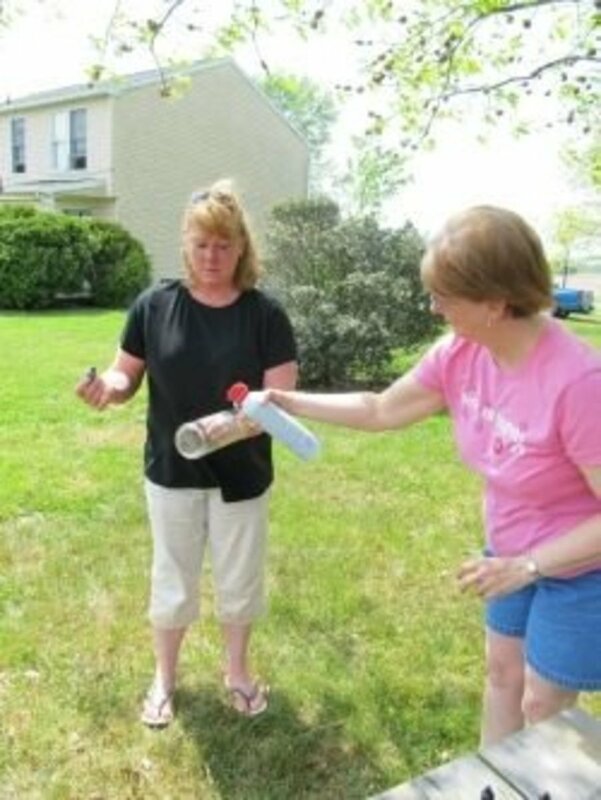 In the photo below, my aunt and sister-in-law are working together because it was very windy outside. One held the vase and dropped the ink, and the other sprayed the compressed air. When you're finished with the design, seal the glass with at least two coats of clear acrylic sealer. Spray thin coats so it doesn't run or drip on the project. Make sure to apply it in a well ventilated area. Depending on what finish you want, Rustoleum and Krylon offer sealants in matte, satin, and glossy finishes. 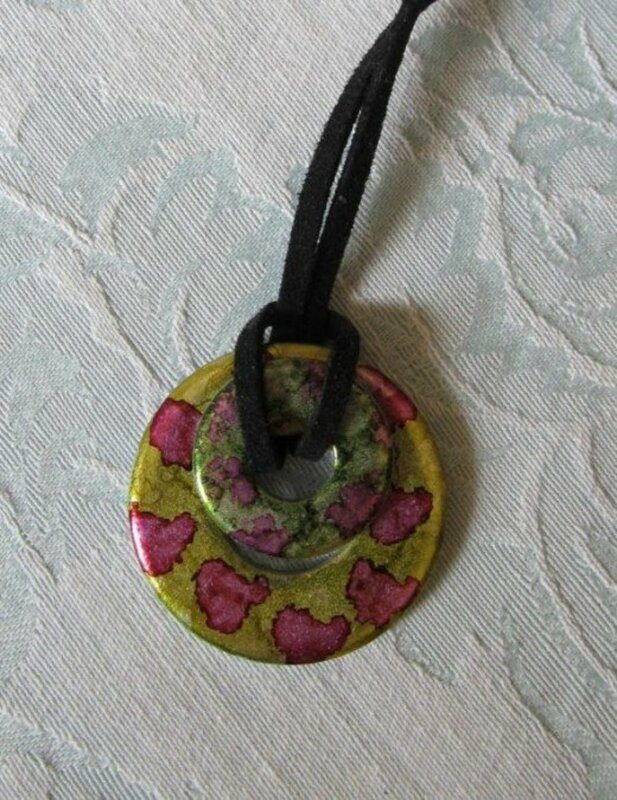 Using alcohol ink on thrift store finds is a rewarding hobby, and this project is quick and inexpensive to make! I rescued these brandy snifters from a secondhand store for a whopping 10 cents each. 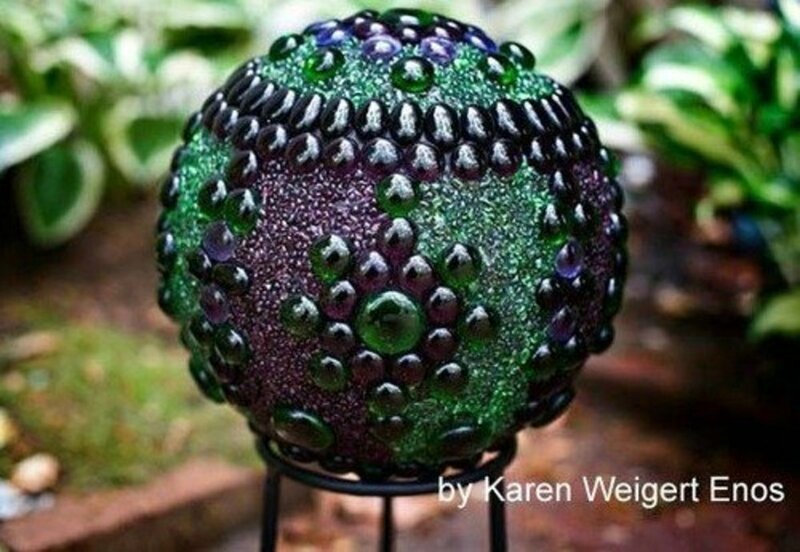 Imagine all of the vases, pottery, and glassware you can buy at a great price to make these! The dollar store also offers a great variety of glassware. When I checked, they had four votive styles, three vase designs, and clear dinner plates. Since alcohol ink should not be used on items you use to eat, you can decorate the back of the plate, seal it, and use it to display cakes or cookies. Where Can You Buy Alcohol Ink? Alcohol ink is readily available at most craft stores. If you don't feel like venturing outside, eBay and Amazon offers a wide variety of colors at good prices. After playing with them on glass for a few weeks, my daughter and I decided we needed more options and we ordered nine new colors from eBay to add to our collection. I prefer the bright, cheerful colors, and my mom loves the fall, earthy tones. The colors used on these candleholders are: Lettuce, Wild Plum, and Stream. They are wonderful summer colors, but I can't wait to try gold, orange, and dark green! The bottles aren't very big, but they go a long way. The Enchanted Gallery has a useful color chart that shows all of the colors available, unique color combinations, and the results of using alcohol ink on different items. Tim Holtz demonstrates the spatter technique on glossy paper. You can see this method below, which is what I used for this project. It also works well for metal surfaces! Do You Like the Look of Alcohol Inks? I am just starting out using Alcohol Inks. Are there any particular colours, techniques or stamps I should start out with? Does the Archival Ink work on plain glass alone? Just starting, love the look. 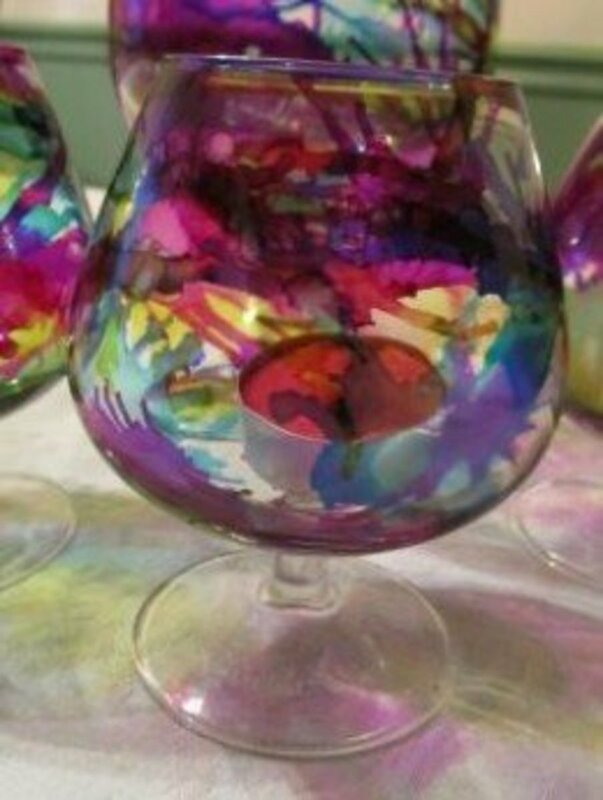 I sprayed over an alcohol ink wine glass design with clear krypton satin spray. It totally melted the ink and ruined the design. What did I do wrong? I painted with Tim Holtz adirondack alcohol inks on glass without a sealer, and now that they're drying, it has a somewhat sticky texture. Is this going to be how they permanently feel or will this go away after more drying time? These certainly have the 'wow' factor! That caught my eye! Would be nice to try this in my class! Love the glasses that you got at the thrift shop. A "before" and "after" photo would be great to see! I love the look of the alcohol inks on glass! I'm looking forward to trying this one day. Thanks so much! It looks like lots of fun and it sure is pretty too. Very good info about alcohol inks. Great technique, well explain. Blessings! this is a very good personal gift! And while you make it, you too have fun! Thanks a lot for this lens. i didn't know you can make art with alcohol!!! I sure do and this is my first exposure to alcohol inks. I'll have to try this technique on wine bottle votive covers. Love the look! Very unique. I do indeed. I did not know what alcohol inks were before reading your lens. Now I realize that I have probably seen examples of their effects hundreds if not thousands of times. Very nice...not heard of alcohol ink before! Very artistic ideas. It's colorful, too. Great ideas; so many crafts, so little time! What a novel idea. Good to see alcohol being put to good use. Love it! Better than I expected. I am enjoyed to read your awesome lens, you made lens different from other lens masters. I appreciate you for making such a great lens. Absolutely beautiful. Love the effect of alcohol ink on glass. Never heard of it before but after reading your lens, I think I will give it a go. Thank you so much for providing the information. Looks like the possibilities are endless. These inks really make the glasses look great. Great info. Also thanks for liking one of my lenses. Beautiful! Any idea how the ink holds up on outdoor items? 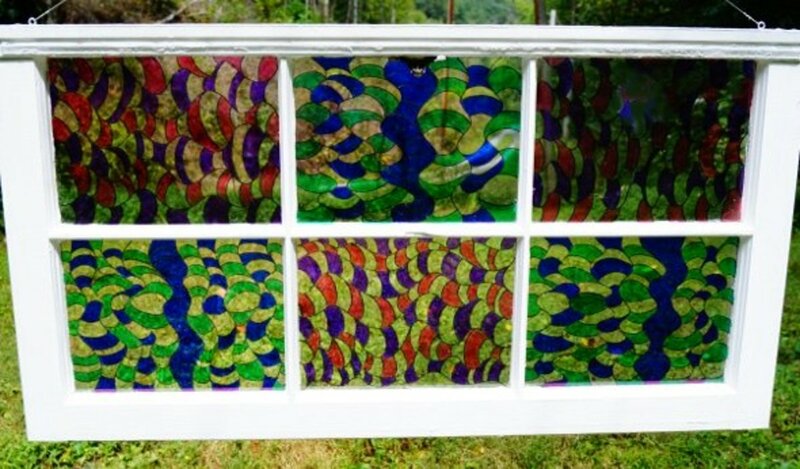 I'm thinking about using the technique on the clear panes of an old window to imitate "stained glass." And then hang the window in the garden where the sun can shine through. It would have to stand up to rain and heat. Thoughts? These are really cool. I would love to try doing this some time. Thanks for sharing! 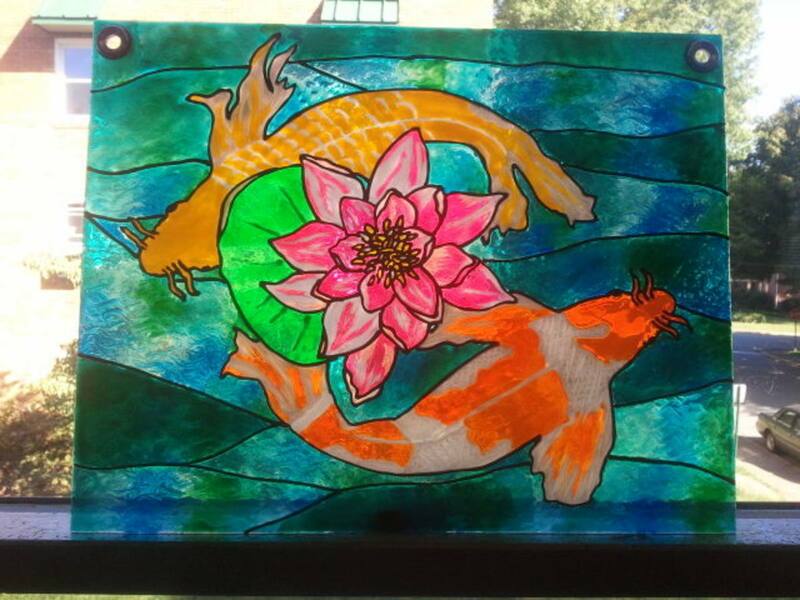 I think that using alcohol ink is a great technic for decorating glass. I think I just found a NEW Hobby!!!! This looks like fun, what is the biggest sheet of paper can one get? I would Love to make one 3 foot square for my wall!! Yes, looks lovely. Had no idea alcohol could do this. These are so beautiful! Thanks for sharing such a great idea. I did not know there was such a thing as alcohol ink. Thank you for this information. @Lindasc333 LM: They're beautiful outside when the sun is shining on them during the day and with candles at night. I didn't know this existed, very cool! Pretty glasses. I love to do arts and crafts. Great ideas. Great Lens. I have some old jars that used to hold candles. This would be a great way to update them, add a new candle and stick them on the patio. Very pretty, thnks for making this informational lens! Amazing creativity. I'm definitely gonna try this art. Thanks for sharing. Those glasses are gorgeous!! I'm going to have to try this. Thanks! Excellent lens - pinned too! Interesting. First time I have seen this. SquidAngel Blessings for a fun and interesting lens. Very nice medium for a craft project. They look really good, so colourful, and it's great that you managed to get the brandy snifters cheaply. This is very interesting, thanks. 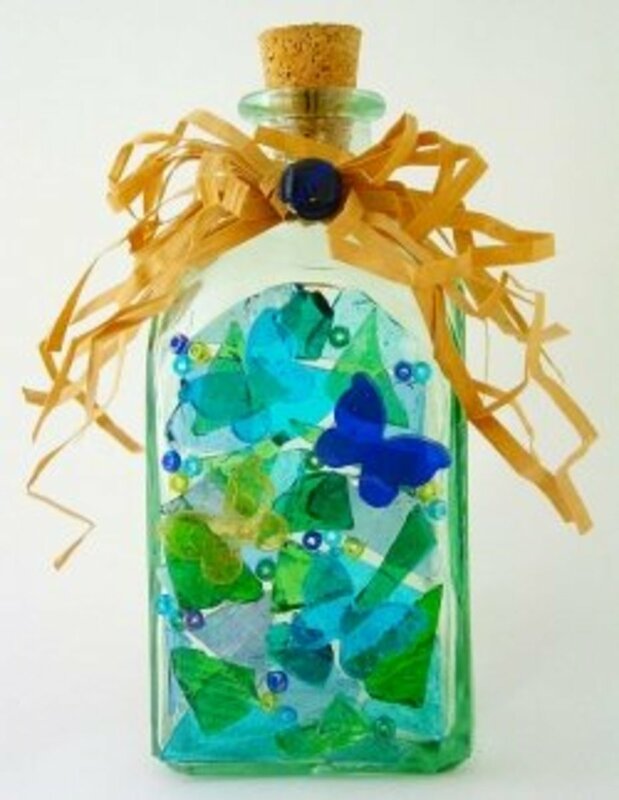 Been looking for a way to decorate old bottles I fond floating in the ocean and this gives me some ideas. I really like the designs. What a great idea! Congrats on making it to the homepage... Your glasses look so pretty! 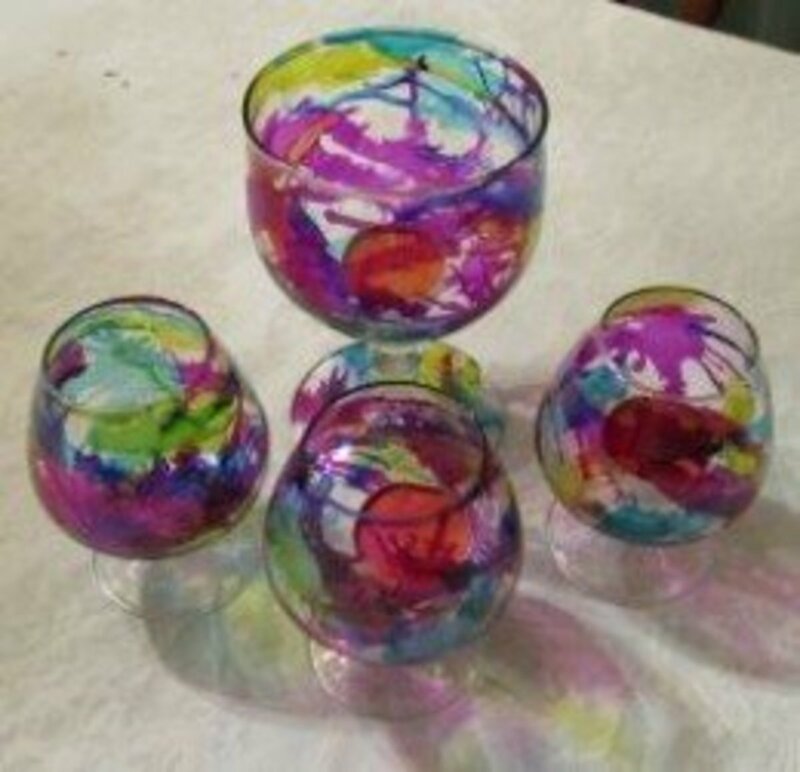 Very nice alcohol ink crafts! Congrats on your homepage feature! 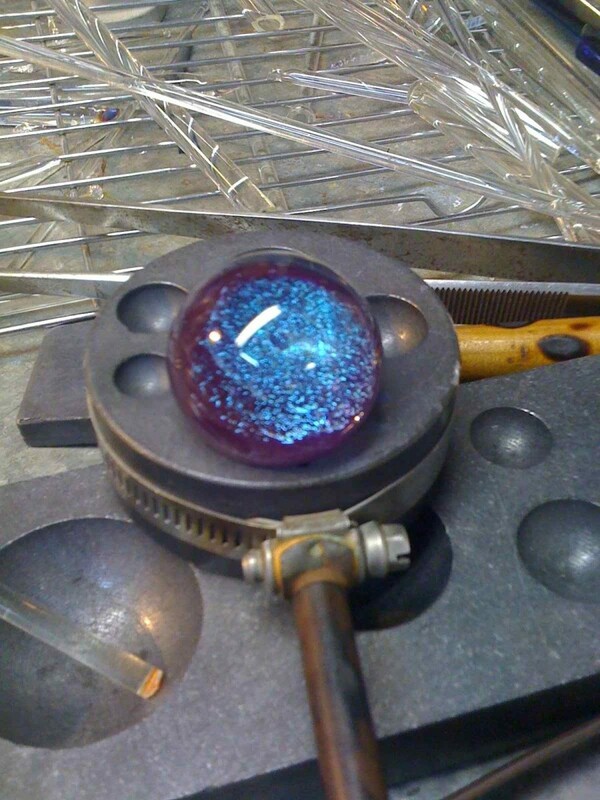 This is something new to me, it can really gives a beautiful color especially on glass. Thanks! These are so pretty. I love the colors! Wow, your designs are lovely, I love the bright colors. These are beautiful colors. I need to find something I can use alcohol inks on --this looks interesting. Thanks. This is so cool. I have never heard of alcohol inks before, and the inks on glass is amazing. Thanks for sharing! @purpleslug: Thanks for stopping by! I've never used alcohol ink but sure want to give it a try now, what a low cost and wonderful way to create beauty, congratulations on front page honors...and epic day for you! I do like the look! They are very pretty. Wow, beautiful designs and a nice lens with easy to follow instructions. 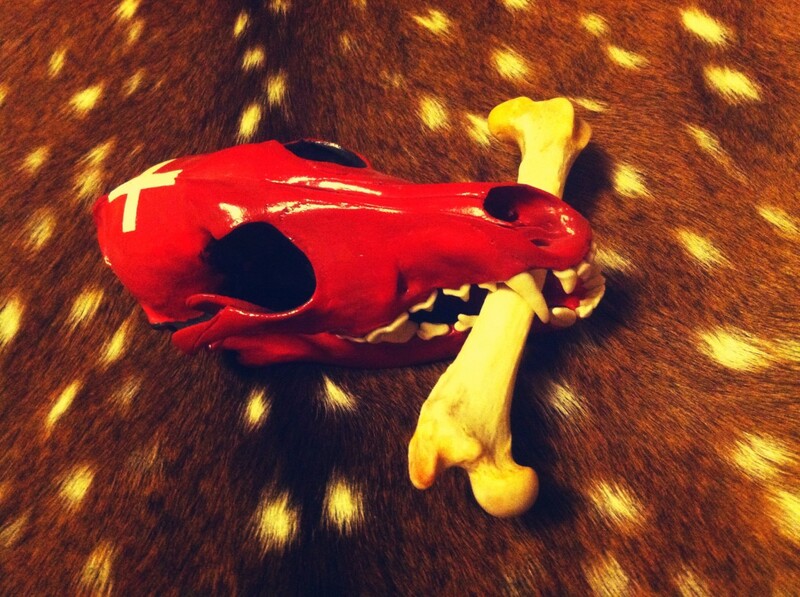 @VeseliDan: Thanks for the blessing :) It made my morning. @bensen32 lm: It does look like tie dye. We have been experimenting with a new technique that I will have to post soon. Thanks for stopping by. never heard of this before....thanks for the idea going to look into it. I dye tye and this looks like it could be as much fun. Really pretty. It has a stained glass look which I love. Thank you for sharing this new to me artistic technique. I'm Going to let Shawn try this. He wants to sell plants in containers we find at the millions of thrift stores down here so this may be something he can try also :) Thanks so much for sharing it! So cool! I had never heard of using them this way. What a fun and easy technique. Thanks for sharing. These are very cool! I bet with a candle glowing inside these are even prettier! @JoshK47: Thanks for the Blessing Josh!!! These are so cool! Thanks for sharing - blessed by a SquidAngel!